Attire: Workout Attire, socks if you're renting climbing shoes. 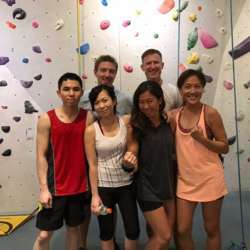 Climbing can develop upper body strength such as your bicep, triceps and lats, also your quads, heels and toes have to work together to make the best climbing experience. Are you game for it? Did we mention that there's drinks and dinner after climb? So RSVP now and CLIMB ON!